I was a reluctant social media player—signing on was an afterthought; engaging my friends online instead of face-to-face or by phone felt impersonal; and posting my personal business was not my style. No, I didn’t announce my pregnancy or post updates about the progression of my labor on Facebook. (In fact, my son was several months old before I introduced him to the social media world…thereby, surprising many a-folk who never knew I was expecting in the first place! *shrug*) But the gushing, enamored mom I’d become finally broke (some of) my reserve wide-open. Inspired, I began to share the magical moments I was experiencing with my son. Along the way, “dhamma mama” became my signature at the end of posts about motherhood as well as movement, mindfulness and meditation—the heart and foundation of my yoga teaching practice, 3 Jewels yoga (formerly, dharma yoga arts). When my yoga mentor-teacher suggested Twitter (pause. breathe. really?! one more account? one more password?) as another space for the emerging voice of @DhammaMama, I decided to use those 140 characters to gauge how consistent and committed I could be to this process of making my private musings so…public. 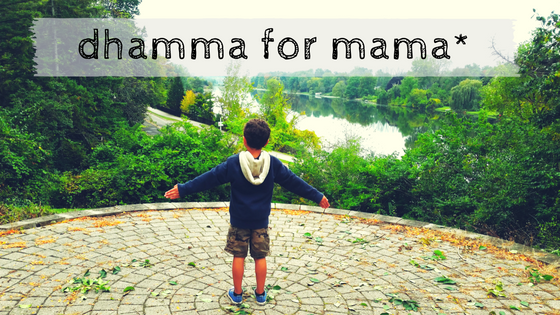 dhamma mama is my ever-evolving, aspiring self who is teaching, learning, understanding and celebrating my experiences as a parent, partner, yoga teacher and Buddhist practitioner. Mitigating the inevitable madness of motherhood with its unmistakable magic through the wondrous practice of mindfulness, I envision dhamma for mama* to be a treasured space for mothers AND all others who love, nurture, empower, educate, advocate for and are inspired by children. That is so sweet of you. You’re giving me much to aspire to on this path. Bowing to you in gratitude!